A detective who helped foil a multi-million pound drugs operation said trade in banned substances was the "principal driver" of violence. Paul Prescott, from Alicante, in Spain, was jailed for two years and two months after 700kg of Class B drugs was found in a warehouse in Sandy, Bedfordshire. The case is being featured on Channel 4 programme 24 Hours in Police Custody. 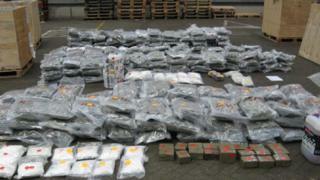 Det Ch Supt Mark Lay said the drugs trade was "inextricably linked to... outbursts of violence". Bedfordshire Police worked with UK Border Force in the investigation, which began with the tracking of the drugs haul from the Port of Felixstowe in Suffolk en route for Sandy. The operation also included sending officers to Manchester Airport to arrest Prescott, who is originally from Liverpool. Prescott, 55, was jailed at Luton Crown Court in September 2017 for conspiracy to supply Class B drugs including amphetamines, herbal cannabis and cannabis resin. Last week five gang members in Bedford were jailed over a spate of violence including kidnap and grievous bodily harm, a serious stabbing and a drive-by shooting. Judge Nigel Lithman QC said the gangs "were at war" with one another over the trade of Class A and Class B drugs. "The defendants have been involved in the worst blight upon life in this country, involving the toxic combination of gang association and the use of knives and guns in pursuit of their rivalry in the course of the drugs trade," he said. Det Ch Supt Lay, who oversees Bedfordshire Police's response to serious and organised crime, said: "Drugs continue to be the principal driver of serious violence in our communities. "Vulnerable drug users are subject to incidents of financial and sexual exploitation, as well as cuckooing. We are seeing increasingly younger children becoming involved in drug dealing, and a surge in drugs related gang violence within our county."